Visit Santa Barbara received Visit California’s Poppy Award for Best Social Media Campaign in recognition of its “Brighten Your Day” initiative. 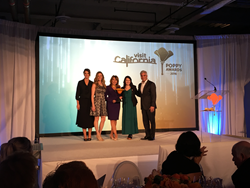 The awards were bestowed Feb. 23 at Visit California’s 2016 Poppy Awards & Industry Recognition Gala in Oakland, which honored excellence in tourism marketing across the state. Visit California President and CEO, left, presented a 2016 Poppy Award to Visit Santa Barbara staff, from left, Noelle Buben, Kathy Janega-Dykes and JessyLynn Perkins, with VCA's Jot Condie. Visit California, the marketing organization for travel to the state, presents Poppy Awards biennially in a contest that honors the best and brightest of California tourism promotion. Winners were selected by a panel of industry marketing experts in seven categories ranging from best overall marketing program to best digital campaign. Visit Santa Barbara, the destination marketing organization for the Santa Barbara region, was also a finalist in the category of Best Overall Marketing Program under $500,000. The Poppy Award comes on the heels of several other honors that Visit Santa Barbara has received for the Brighten Your Day marketing campaign. They include Adrian Gold Awards for Complete Advertising Campaign and for Best Social Media Campaign from the Hospitality Sales & Marketing Association International (conferred earlier this month), as well as prestigious Destinations Council Destiny Awards for best Branding & Integrated Marketing Campaign and best Social Media Campaign from the U.S. Travel Association (awarded in August 2015). Conceived by ad agency MMGY Global for Visit Santa Barbara, the Brighten Your Day campaign was created to drive visitation from residents of cold-weather states in the off-season months, November through March. Sparkloft Media managed the social media component of the Brighten Your Day campaign. As a result of the social media campaign, Santa Barbara saw website visit increases ranging from more than 50 percent in Portland, Ore., to 20+ percent in Denver. Overall, the campaign reached 7.14 million users, with more than 1,200 competition entries, and total campaign engagement came in at 36,222 — the most engagement Visit Santa Barbara’s social media channels have seen to date from a campaign. Visit Santa Barbara is a nonprofit 501(c)(6) organization jointly funded by the City of Santa Barbara, the County of Santa Barbara, the South Coast Tourism Business Improvement District and by a membership of hospitality-related businesses. The primary mission of Visit Santa Barbara is to enhance the economies of the City of Santa Barbara, South Coast communities and Santa Barbara County areas through tourism marketing that increases business revenue, tax revenue and creates jobs. Annual spending by travelers to the South Coast totals more than $1.5 billion, supporting more than 12,000 jobs and generating more than $45 million in yearly tax revenues, according to Destination Analysts, a tourism market research firm. A high-res photo from the Poppy Awards is attached. Photo caption: Visit California President and CEO, left, presented a 2016 Poppy Award to Visit Santa Barbara staff, from left, Noelle Buben, Kathy Janega-Dykes and JessyLynn Perkins with Visit California’s Vice Chair of Operations, Jot Condie. Credit: Courtesy of Visit Santa Barbara.